Select: Chapter 3 - Requirements for Licensure and Renewal Section 12. Dental and Dental Hygiene Relicensure. (ii) Verify current certification in CPR; (ii) Submitting evidence of completion of ten (10) hours of hands- on clinical continuing education for each year not actively practicing. Section 4. Continuing Pharmaceutical Education Requirement. In accordance with W.S. § 33-24-121, all pharmacists must complete and report 12 contact hours (1.2 CEU’s) of approved continuing education obtained during the previous license period in order to renew their license to practice pharmacy. Section 9. Approved Programs. a. Any program presented by an ACPE approved provider subject to the following conditions. i. Pharmacists may receive credit for the completion of the same course only once during a license period. ii. Proof of participation shall be a copy of the certificate issued by an approved ACPE provider, which includes name of participant, ACPE program identification number, name of program, contact hours approved, signature and date signed by ACPE approved provider. c. Basic cardiopulmonary resuscitation (CPR) courses which lead to CPR certification or recertification by the American Red Cross or the American Heart Association shall be recognized as approved programs. Pharmacists may receive credit for one contact hour (0.1 CEU) towards their continuing education requirement for completion of a CPR course only once during each license period. Proof of completion of a CPR course shall be the certificate issued by the American Red Cross or the American Heart Association. 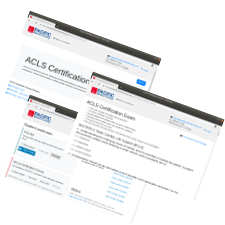 Any entity that conducts Advanced Life Support education for initial certification must have their ALS program accredited by the Commission on Accreditation of Allied Health Education Programs (CAAHEP). Total number of locations: 1. These locations CAN provide American Heart Association-branded provider cards if needed.